It is summer! That means it is time to start planning for the next school year. 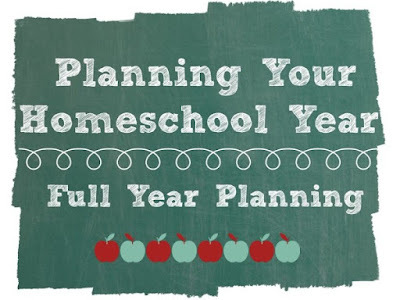 I love planning when I have the time to do it and during the school year it is near impossible for me to have the time to do it. Not only am I a home educator and a mom to three children, but I also have a job in the evenings. My schedule is jam packed from September through June, so I do the bulk of my planning and prepping in the summer so that we can get on the train in September and steam through. You can see I color coordinated the changes to be the same between the two. 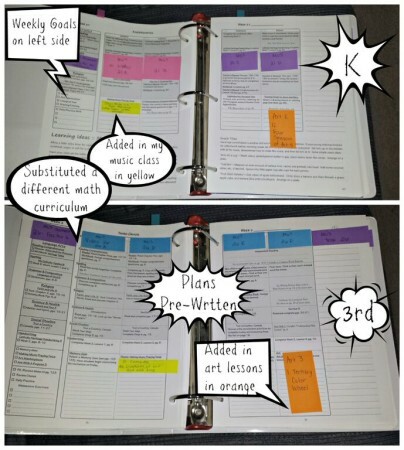 It took me a few weeks to get all the lesson plans fixed up and ready to go for the year. The nice thing about these particular lesson plans is that they are only four days a week. That gives us wiggle room for sick days, co-op days, field trips, vacations, and mental health days. Although we will started "official" school in August, we had spaced out school so that it tooks us through June with plenty of breaks to keep us from hitting a wall. As much as I love planning the year out ahead of time, I came upon a couple problems with this set-up. First, because these are the “master plans,” I don’t want to write in the books and make marks. Also, there are two books of lesson plans and I don’t want to be paging through them to get the lessons for the day. Finally, I am never going to remember what we are doing next week since everything is planned back in the summer! I will inevitably forget needed items for science labs and be ill-prepared for lessons. That is why I actually have a separate lesson plan book to work in. 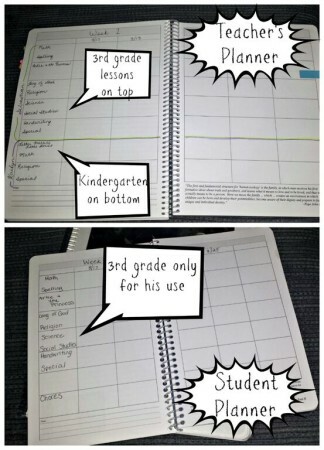 I have my large lesson plan book as well as a student planner for my third grader to use independently. I have all my daily information in this lesson plan book. It includes a calendar with co-op days, my work schedule, family birthdays, contact information, etc. It is my get-me-through-life book. Each Friday I find a few minutes to go through and write down the plans for the next week. At that point I make a shopping list for things I might need for the following week. This helps jog my memory and gives me a couple days to get things or prepare things, if need be. On Sunday evenings I go through and write down the assignments in my third grader’s lesson book. I highlight the things he needs to do with me, but everything else he can do independently. I also pull out any worksheets he might need and get them ready to go for the week. These preparations during the year are minimal compared to what I do in the summer. It also helps my stress level stay as low as possible during the school year. What about you? How do you plan your year? Do you do it all at once or every week or somewhere in between? I hope I have inspired you to try your hand at planning ahead. Let me know how it goes!